State of the art instrumentation and services. CECO Emissions Testing mobilizes the highest quality technology and technical expertise to each job. 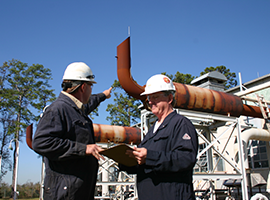 Our proven engine experts have over 30 years of combined experience perrorming air emissions compliance testing to meet EPA and state regulatory requirements with our state–of–the–art instrumentation. Our cutting–edge trailers are equipped with dual sets of analyzers, allowing two tests to be performed simultaneously. Alternatively, inlet/outlet measurements can be taken for destruction efficiency calculations. We are one of the few companies that routinely mobilize equipment to every client site allowing for simultaneous inlet and outlet real time formaldehyde measurements. Our experienced FTIR technicians and engine analysts can evaluate engine emissions as well as the mechanical health and performance of your engines. If an engine is found to be out of compliance, CECO Emissions Testing personnel can tell you why and suggest adjustments or other remedial action. All data collected goes through CECO’s 3–tier extensive quality control / analysis program, ensuring accuracy and defensibility. All laboratories (including stack testing companies) must be accredited to work in the state of Louisiana. CECO ETS is accredited through the Louisiana Department of Environmental Quality (LDEQ) by its Louisiana Environmental Lab Accreditation Program (LELAP). There are numerous regulations that govern the emissions from Internal Combustion Engines and Stationary Gas Turbines. Please see Engine and Turbine Regulations below for a brief summary of the ICE & Turbine Air Regulations in Texas.